Tonight we are heading to my sons' school to attend the Winter Wonderland event to make, and decorate gingerbread houses. Buddy and Max thought it would be fun to give the boys kits, in place of the graham crackers that we will be building with at school. (Knowing my boys, they will have zero patience in building and holding the houses together while the icing sets! The fun part is the decorating with candy, and I know that the kids will LOVE that part! Have you made a gingerbread house with young children? How did it go, were they interested in the project, long enough to finish it? I've done it many times and surprisingly, the interest never waned! Hope it goes well for you guys! We have done it, but my Boys did loose interest. 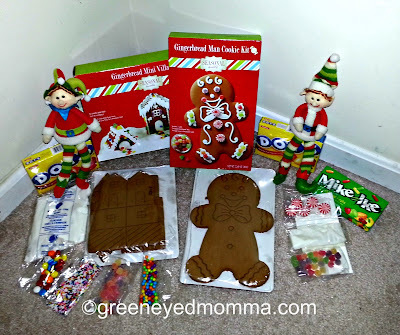 I had not seen the Gingerbread Man Cookie Kit- I think they would have a blast with it! Thank you Mary for stopping by. You are 100% correct I had their interest for about 20 minutes... Then they were done!